News - Frontierville Express - More Than Just A News Site: Bottoms up! "Two pints of Fosters, one vodka cranberry, an orange juice and 4 chicken nuggets and chips for table 27 please... do you bring it over?" 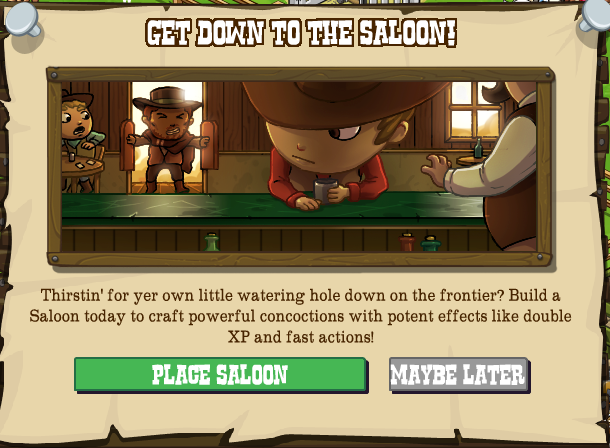 Yes folks, your evening out on the Frontier is all set as we open the latest Saloon in our countrywide chain on YOUR homestead! Come along and sample all the concoctions that our talented bartenders can make that'll cheer you up on those gloomy evenings and give you the energy to keep on going! Once you get the offer to build yourself a Saloon be sure to place the building or, if you need to do a little civic engineering to find the space, you can find that there building in the market later. Pop down the base and give it a fair few whacks and it'll build up the frame then you'll be after a few new building supplies to finish it off! 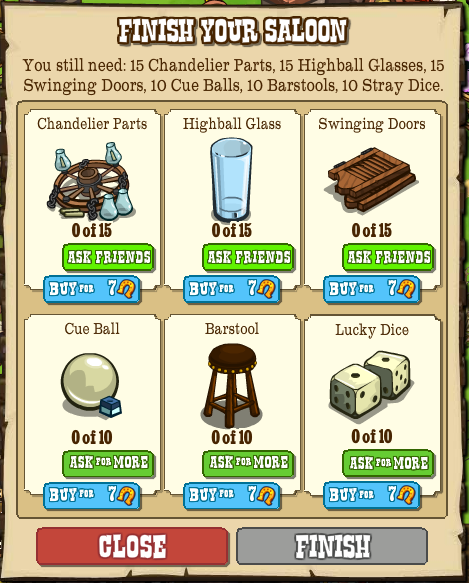 You can ask folks directly for chandelier parts, highball glasses and swinging doors (y'all need 15 of them due to how many times they get busted off their hinges in a fight...). Cue balls, barstools and lucky dice y'all have to stick up a poster on your wall asking for them. Please note the company takes no responsibility for losses gambling with non-official dice. 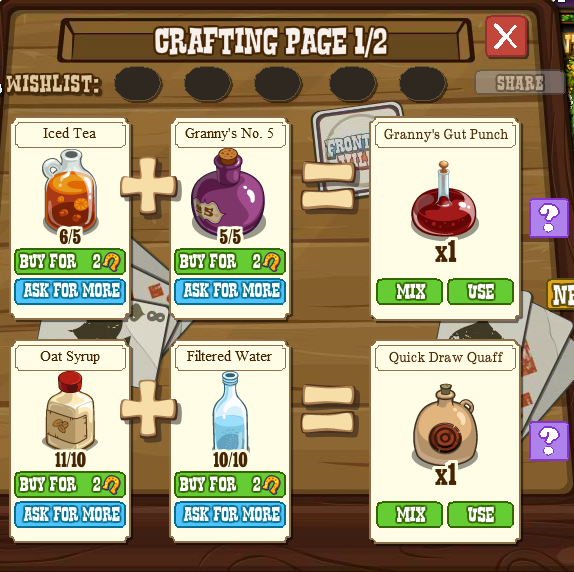 Once your saloon is built our highly talented and experienced bar staff will will give you the chance to get your hands on some of their special brewing creations to help you on your homestead. Please note that as Franchise owner you will be responsible for providing our staff with the required ingredients and some drinks are only available after a specific MISSION has been passed. Made with iced tea and Granny's No. 5 special ingredient, Granny's Gut Punch is just the thing to enhance your experience of the world around you and sharpen your senses to everything. This drink is both strangely comforting and uniquely spicy and will double up all the experience you get for a hefty four hours until the drink wears off and you'll be chasing up our staff for another of those extra special mixes from the desk of Granny. Please note side effects include an increase in blood flow causing reddening of the skin, a loss of balance and temporary short term memory loss. Merging the natural tastes of oat syrup and the freshest of filtered water collected each morning from the horse trough a crystal clear mountain spring in a secret location this drink refreshes the parts that other drinks either can't, or don't wish to go near. Its thick barley taste may remind some of Irish stout and others of the time they chewed a mouthful of roofing insulation for a bet. Whichever it feels like to you it'll energise you in ways you've never felt before and let you do five times the work for your energy as usual for an entire hour! Please note side effects include a yellowing of the skin, a loss of balance and temporary blurred vision, if blurring lasts more than 14 days contact a doctor. A confusing combination of two flavours that shouldn't work, and yet do. Although the clash of freshness from the Varmint Julep and the heady hot spice of the mule kick mix gives you the impression of a mad battle in your tastebuds it soon becomes an attractive chaos that invigorates your brain through your tongue and gives you the impression of having sucked upon a leaking battery. For two hours the electric buzzing in your head will speed up EVERYTHING you do on your homestead, it's also the only drink that will freshen your breath, kill off harmful bacteria in your mouth and remove the enamel from your teeth. Please note side effects include a green tint to the skin, a loss of balance and, due to the quickening nature of the concoction, increased possibility of bedroom disappointment. 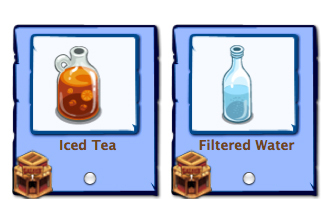 The drink ingredients can be collected in mission rewards, requested from friends or sent as a gift from your free gifts page, everyone will have two random ingredients from the six! 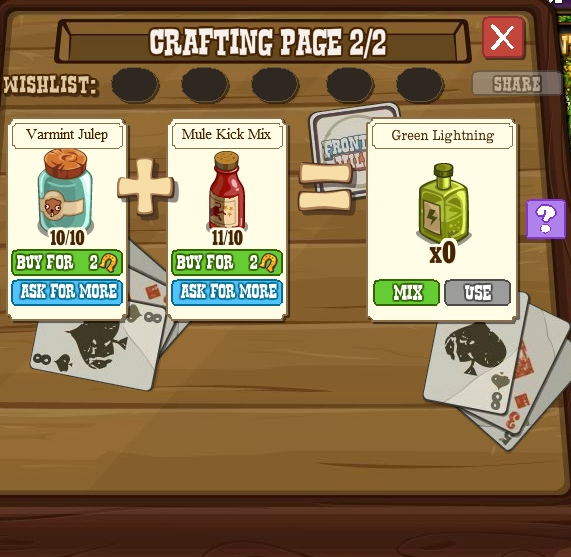 When you craft a drink or find one in the saloon Daily Bonus you may find too many in which case it's time to buy a round! Keep getting those drinks made up and you'll be on your way to getting some badge rewards! 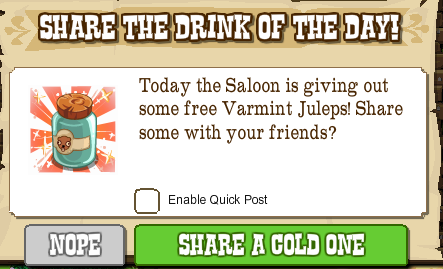 Collecting the daily bonus also gives the chance of a Saloon Collection item dropping! So, how happy are you about the Saloon?! Be sure to come tell us at our Facebook Page!